Hammond Manufacturing Eclipse™ Junior Series 1-Door continuous hinge junction box with quarter-turn, features 304 stainless steel construction for longer endurance. 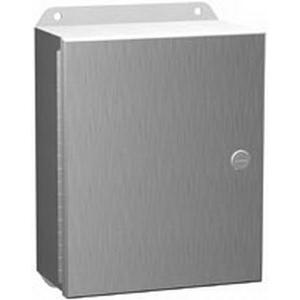 This ANSI 61 gray junction box featuring smooth brushed finish offers immense resistance against impact, moisture, abrasions, corrosion, chemicals, weather, scratches and UV rays. It measures 12-Inch x 12-Inch x 6-Inch. Formed lip on enclosure aids to exclude flowing liquids along with contaminants. Junction box is provided with bonding stud on the door and grounding stud on the enclosure. It comes with grounding and panel mounting hardware. This NEMA 4X junction box is suitable for use as instrument enclosures, electric, hydraulic or pneumatic control housings, electrical junction boxes or terminal wiring enclosures. It provides protection where equipment may be hosed down or otherwise be very wet or in outdoor applications. Junction box is UL listed, CSA certified, CE approved, RoHS compliant and meets JIC/IEC standards.